Sharpnose Sharks - The sad demise of one the most common sharks in the world. The Sad Demise of one of the most common sharks in the world. The family Carcharhinidae contains a diverse selection of species from tiger sharks to hammerheads. 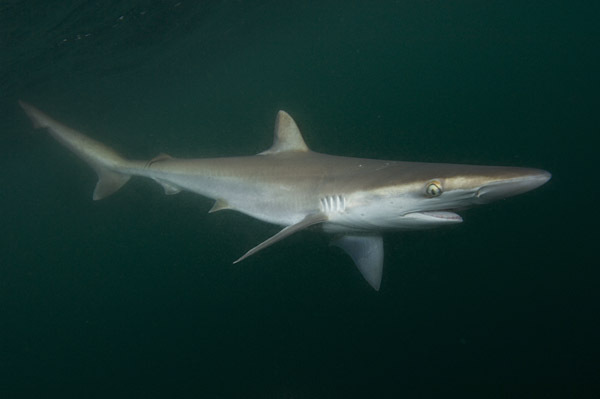 Many are large, powerful animals that play a vital role in the check and balance of life in the oceans, but there are less celebrated (yet equally important) carcharhinids such as the diminutive sharpnose sharks which live along virtually every continental coastline warm enough to support them. These omnipresent predators can be found from the Eastern Atlantic to Northern Australia and where they occur, they tend to abound. There are currently seven described species of sharpnose sharks in the genus Rhizoprionodon. However, there is some conjecture among taxonomists regarding the correct number because the Atlantic sharpnose R.terraenovae and the Caribbean sharpnose R.porosus are practically indistinguishable from each other. Vertebral counts officially differentiate the two but some taxonomists feel that vertebral variation is like the differences between eye colors in humans; genetically significant but not worthy of separate species status. For the last eleven years Dr Eric Hoffmayer from the Gulf Coast Research Lab in Ocean Springs, Mississippi has been conducting an abundance and distribution study on the inshore sharks of the northern Gulf of Mexico. Dr Hoffmayer’s longline and gillnet surveys are concentrated around the barrier islands of the Mississippi Sound where shark for shark, Atlantic sharpnoses outnumber all other species combined by nine to one. Dr Hoffmayer is perplexed by the influx of thousands of almost exclusively male sharpnose sharks into the Mississippi Sound each summer because as habitats go, the sound has very little to offer. As well as extremely low salinity which tests the sharpnoses’ ability to osmoregulate, the Mississippi Sound is plagued by areas of very low oxygen (dead zones) which are far from ideal for a ram ventilator like the Atlantic sharpnose to be foraging in. During the oppressive summer months, the water in the sound also becomes extremely warm which adversely raises the shark’s metabolism to the point where it has trouble maintaining a calorific uptake high enough to keep up with its increased energy expenditure. Dr Hoffmayer believes that this is why male Atlantic sharpnose sharks enter inshore waters with large oil rich livers, but by the end of the summer their livers have shrivelled to a third of their original size. Unable to consume enough food to compensate for their elevated metabolisms, the sharpnoses are forced to use up their internal energy stores. Even their muscles lose a significant amount of their mass which leaves the sharks looking visibly emaciated. Local fishermen call these withered little sharks ‘wormies’. Sharks generally use a combination of lift created by their forward momentum and buoyancy provided by their oil rich livers to counteract their natural tendency to sink. 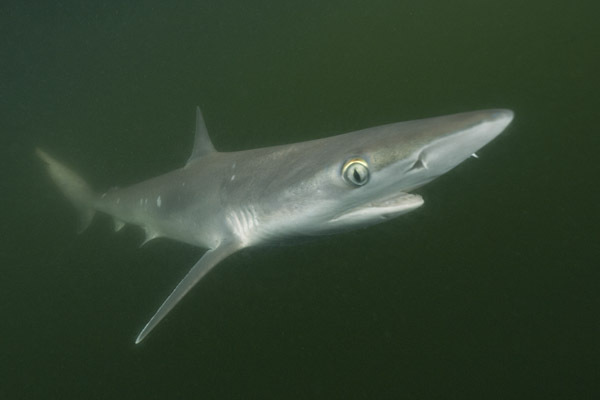 Interestingly, Atlantic sharpnose sharks must be capable of adjusting their swimming technique so that they can negotiate their liquid world without their natural internal buoyancy aid. It is a common strategy among some shark species to give birth in coastal lagoons where there is protection from larger sharks and an abundant supply of food that the newborns can feed on until they are big enough to venture further afield. Female Atlantic sharpnose sharks also head towards shore in the summer but they generally give birth long before reaching the relative safety of the shallows. Dr Hoffmayer has a couple of different theories on why this may be. Possibly, the gravid females need to conserve more of their energy to nurture their unborn young and therefore they may simply not have enough stamina to complete a long shoreward migration. Alternatively, female sharpnoses may be more stenohaline than males i.e. they may not be able to tolerate the low salinity that occurs in the sound. Sharks osmoregulate by excreting excess salt through their rectal glands as their environment becomes less salty. If they fail to do this they effectively drown through osmosis; the process by which fresh water continuously tries to infiltrate saltier environments. By excreting salt, the osmotic gradient between the shark and its surroundings is minimised and the sharks do not become water logged. Juvenile sharpnose sharks have very efficient rectal glands and are well adapted to life in brackish water. In fact, they are able to tolerate salinity as low as 16 parts per thousand. Adult males can only handle a salt content above 22ppt so as sharpnose sharks mature they tend to avoid water where their offspring are hiding. As sharks are cannibalistic by nature, this is a great strategy to protect the young sharpnoses from being preyed on by their parents. If further studies show that female sharpnose sharks are restricted to an even saltier environment e.g. 30ppt, then that would explain why they pup in deeper water, forcing their young to run the gauntlet into the shallows. The sharpnose’s appearance in the sound does not appear to be specifically diet related. Stomach content analysis has revealed that smaller sharpnose sharks consume a lot of shrimp and squid whereas larger animals prefer bony fishes especially menhaden. The sound has a reasonably good supply of all these foods but so does the cooler, metabolically more comfortable, deeper reaches of the gulf. So, considering all the environmental hurdles that the male sharks have to overcome just to stay inshore and the lack of female company, why do so many male sharpnose sharks gather in the Mississippi Sound each summer? Dr Hoffmayer believes that it all comes down to safety. Sharpnose sharks are a favourite prey of many other requiem sharks and although bull sharks, blacktips and various other large sharks also venture into shallow water, compared to the shark eat shark world of the greater gulf, the murky Mississippi Sound is a relatively safe place to hide. When inshore temperatures plummet in the late fall, the male sharpnoses are forced out into deeper water where seasonal temperature shifts are less dramatic. In the Gulf of Mexico, Atlantic sharpnose shark numbers remain high. This is partly because there is no directed sharpnose shark fishery and partly because Atlantic sharpnose sharks reach maturity after only 2 to 3 years which among sharks is rather quick. On the west coast of North America the sharpnose story is somewhat different. The Pacific sharpnose shark R.longurio is an important food fish and the focus of a large artisanal fishing effort. 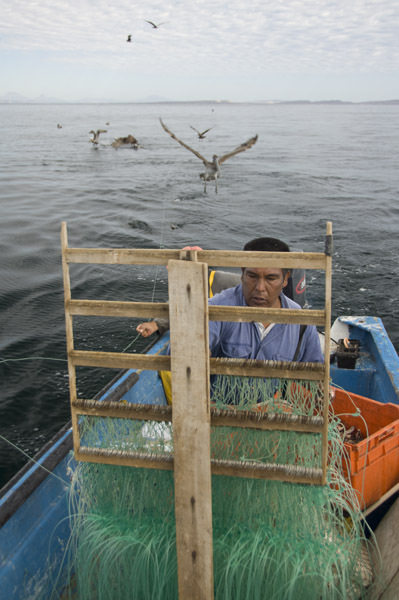 Everyday, scores of panga based long-line fishermen ply the coastal waters of the Sea of Cortez in search of sharks. 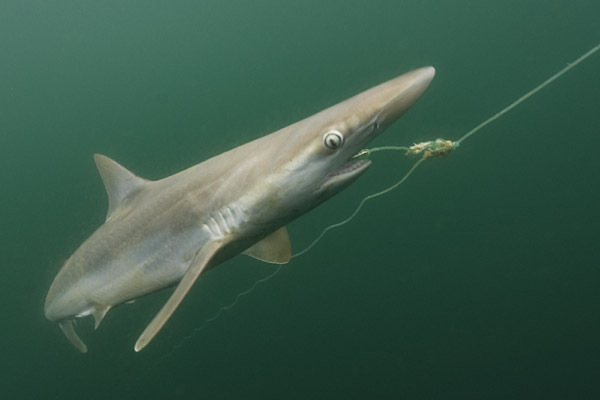 As in the Atlantic, sharpnose sharks are the most commonly caught inshore species but small hammerheads and smoothhound sharks are also taken in fairly large numbers. Each boat lowers two or three kilometers of braided or monofilament line bristling with 500 to 1000 baited hooks. Catches may range from a few small sharks per set in the summer months to a hundred kilos or more on a successful day during the winter. Little is known about the health of Pacific sharpnose stocks but scientists and fishermen agree that they are probably declining. At present there are still enough sharks to support a modest fishery but this may change if quotas are not implemented soon. One of the big problems is that the gestation period of Pacific sharpnoses may last as long as eleven months so the fishermen consistently catch gravid females before they have had the chance to spawn the next generation. One veteran shark fisherman from Mulegé, who recently returned with seven small sharpnoses after setting 1400 hooks, commented that on his best day twenty years earlier he had landed 1700kg of sharks in the same time frame with inferior fishing gear. A decline of that magnitude does not bode well for the future of the Pacific species. What the long term effect would be of completely removing a once abundant predator like the sharpnose from the ecosystem is unclear but there will inevitably be serious repercussions both up and down the food chain. Iemanya Oceanica is a grass roots non-profit organization based in La Paz that is working with local shark fishermen around Baja. Iemanya is entrenched in a multifaceted shark conservation campaign that includes education and direct assistance to shark fishermen that are ready to look for alternative sources of revenue. Rather than dictating to fishermen how they should make a living, Iemanya’s representatives ask each fishing village to collectively come up with an alternative business plan that will allow them to stop shark fishing. If the plan is practical and sustainable then Iemanya provides as much guidance and financial assistance as possible to help the fishermen change track. Time will tell whether the remaining Pacific sharpnose shark population will succumb to the web of long lines and gill nets that crisscross the shallow bays of the Sea of Cortez. Unlike their larger cousins, sharpnoses are physiologically well equipped to bounce back from over fishing because they mature relatively quickly and they can have up to twelve pups each season. Even if their numbers plummet further, if they are left in peace for a few years there is a good chance that they will eventually recover.